Lanai Jarrico is the editor and owner of the Second Life Enquirer, one of the leading newsletters covering this virtual world. She recently celebrated a double milestone. 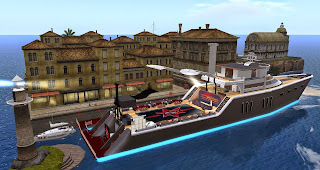 Saturday May 9 was not only when she celebrated her tenth rezzday, but also the tenth anniversary of the SL Enquirer. On the day after the celebration, I met up with her near her yacht at Mont Fleuri Isle for an interview. Bixyl Shuftan: "So how did you first find out about Second Life?" Lanai Jarrico: "I had heard about it from some friends in the Sims Online who were migrating here back in 2004, but I wasnt too interested until filmmakers ... found me there, flew to see me in my state and asked me to bring the paper here." At first I didnt want to come, but decided to take a look." Bixyl Shuftan: "So you were in the Sims Online before coming to Second Life, and doing a paper there as well?" Lanai Jarrico: "Yes the original paper was called The TSO Enquirer. I launched it on October 4, 2004, in the city of Blazing Falls, just weeks before Alphaville Herald. It was known as The Sims Online Enquirer." Bixyl Shuftan: "Interesting. What did you usually cover there?" Lanai Jarrico: "There was a large community of mafia families there, and they used the paper as a bridge of communication. That is what made it go viral there"
Bixyl Shuftan: "People were interested in the mafia there?" Lanai Jarrico: "Oh my God, yes, that is where the roleplay mafia families were born, in my opinion. It was huge. I would say there were more than eight strong families with 25-30 members each. The mafia families migrated here (to Second life)and went underground and branched off into different things. I am still in touch with some of the old godfathers and leaders from those times." Bixyl Shuftan: "What else did you cover there?" Lanai Jarrico: "I would cover the things I did. I was an explorer and just documented my journrey aside from covering Mafia activities. It was just me reporting for the first year, and then I got a mafia writer. But things were getting crazy and I was getting threats." Lanai Jarrico: "Yes. I was a very bold writer and reporting things that caused wars between families. I was asked to be a Godmother by a few because of the power the paper had. I've collapsed families in my writing due to their bad behaviors and antics. And in turn they would get angry and threaten me. When I moved here, I left the mafia reporting behind and began writing about the culture and activities here and made it more mainstream." Bixyl Shuftan: "How did your first days go here? The newcomer experience, and all?" Lanai Jarrico: "Well, it definetly was a learning curve. Before I could launch the SL Enquirer officially, I had to learn how to get around and do simple things like use notecards and such. Then immerse myself in the community and meet people. Once I established some balance, I was able to slowly write about things here. When I was ready, I purched the slenquirer.com domain and made the change." Bixyl Shuftan: "Whom helped you the most in learning how to write as a journalist?" Lanai Jarrico: *thinks on that* "I have to say I've always written in my own style but I learned new techniques from my writers along the way and also college helped because I was writing papers weekly for four years. I also did fashion articles for a company in real life. All that practice taught me a little. I continue to learn." Bixyl Shuftan: "What were the first articles that began to draw an audience to the SL Enquirer?" Lanai Jarrico: "I think the articles that got the most notice were my personal entries labeled 'Lanai's Diary.' I wrote them as if no one else was looking at my innerthoughts on various topics. I think people like the emotion in them. (They were about) sometimes humor, other times just me rambling about something. Then wehn I brought a team of writers onboard, it branched out into various topics from other perspectives, and writing styles." Bixyl Shuftan: "About when did the SL Enquirer overtake the The Sims Online Enquirer in readership?" Lanai Jarrico: "I would have to say the transition took place in a span of six months from TSO Enquirer to SL Enquirer in Second Life. The sad thing is I had to switch hosting like three times, and each time I lost all my readship stats and tons of articles. We had close to 300,000 views in just one of those transitions. Does that answer your question? I hope I understood it." Bixyl Shuftan: "Ouch, that's a lot. You had to put the articles back in the archives?" Lanai Jarrico: "There wasn't a way to transfer them over from the original domain the the 2nd, so a huge loss there, then to the third. I finally settled with blogger and it is about 30,000 pageviews from 1 milllion but in all I'm sure it is close to 3 million if I carried the stats over, maybe more. Google+ stats alone is up to 13.3 million views and I have no clue how it got so high." Bixyl Shuftan: "Nice. After that, did the SL Enquirer look more or less like it does now?" Lanai Jarrico: "No. With each transition, I've changed the look due to each hosting having different templates. But this one I like and it has remained for some time now." Bixyl Shuftan: "Sounds good. What kinds of stories does the SL Enquirer usually cover?" Lanai Jarrico: "I would say a variety of things, such as press releases from our advertisers about events and products, spotlight features on locations, and Avie Polls. In a nutshell, the culture in various forms. I see SL Newser as covering more business topics, while we cover more entertainment." Bixyl Shuftan: "In your opinion, what have been the most interesting topics to cover?" Lanai Jarrico: "I have to say when I do interviews on a person about what they do. Not only do I get to meet someone new and add them as a friend, but I like to see what creativity is going on." Bixyl Shuftan: "You mentioned some of your Sims Online Enquirer articles had gotten threats. Were there any SLE articles that sparked controversy?" Lanai Jarrico: "(laughing out loud) Well yes. One thing I've learned in media is you cannot please everyone." Lanai Jarrico: "While some people might like what I have to say, others get bent out of shape, and I sometimes find nasty anonoymous comments in my inbox. I find it cowardly. If I put my opinions out there for all to see I would respect an opinion from someone who uses their name if they want to challenge me. Otherwise it holds no value to me." Lanai Jarrico: "Years ago, a woman told a mutual friend that I shouldn't be taken seriously because I was uneducated.I didn't have a degree. Rather than letting that woman discourage me, it inspired me to get a degree and continue to do what I do." Bixyl Shuftan: "Has your coverage of Second Life changed any over time?" Lanai Jarrico: " ... Yes SLE is always changing and growing with the times. I'd like to say when I started the paper, it was just for a circle of four friends as entertainment. I had no idea it would go viral, so I had to learn how to adapt and create my own system to make it work. I have no real life journalism background." Bixyl Shuftan: "Well, looking back over the past ten years, which articles would you say have been the most important ones?" Lanai Jarrico: "I would have to say a series of article I wrote in regards to child avatars about six years ago, or even earlier, made an impact. It was right around the time LL changed the Terms of Service about them because of the inappropriote behaviors associated with child avies and pedophiles in SL. Soon after those articles were put out the TOS changed. I don't know if what I posted had anything to do with it, but the timing was right." Bixyl Shuftan: "Interesting. Has there been anything more recent that's gotten a great deal of attention?" Lanai Jarrico: "Yes, a couple months ago a story broke about the Blarney Stone Pub, written by one of my writers. That seemed to kick (a) hornets nest, and we got a huge spike in readership and comments due to it. Drama and controversy will do that. I've kind of stepped back from writing opinion pieces." Bixyl Shuftan: "How did the writing ... create drama and controversy?" Lanai Jarrico: "Well, the story focused more about how they treat visitors and the way staff conducts business. The writer pointed out how they treat people and it sparked a firestorm in comments from both sides. Those who were mistreated while visitng their and staff trying to defend themselves: http://www.slenquirer.com/2014/09/a-dark-peek-into-once-mighty-sl-blarney.html . Bixyl Shuftan: "Well, now that ten years have come and by, do you have any words of wisdom to Linden Lab or people thinking about giving Second Life a try?" Lanai Jarrico: "I have to say Second Life is not like it used to be. The wide eyed wonder of something new has faded for those of us who has become established residents and learned the ins and outs of this community. I feel like the morale is declining because Linden Lab isn't as involved as it was in the beginning, and we are left to deal with newer residents who don't share the same sense of community as the elders. It makes it difficult for us to maintain what is left of the hope we have in it continuing to be the best virtual world. Now with the new SL 2.0 grid being on the horizon, peole are wary and have questions. Linden Lab could lose the trust of people if they do the same thing there that they have done here. People feel abandoned." Lanai Jarrico: "Another thing I see happening more now is people have been so accustomed to forgetting there are people behind each avatar and aren't as thoughtful and caring as before. That's bad." Bixyl Shuftan: "What could happen if those trends continue?" Lanai Jarrico: "It will lead to the death of virtual worlds for people who are investing lots of money. Well, not all virtual worlds, but Second Life would fail, and become a playground for griefers. I still have hope because I still see elders here, but they are becoming more rare." Bixyl Shuftan: " ... Was there anything else you wanted to add?" Lanai Jarrico: "Not that I can think of. ... Thank you Bixyl." Bixyl Shuftan: "Welcome Lanai. (smile)"
It was then that we parted ways. Lanai Jarrico continues to run the SL Enquirer, writing about the entertainment side of Second Life. Did you know that you can shorten your urls with AdFly and get dollars from every visitor to your shortened urls. Did you know that you can get these ON AUTO-PILOT AND ABSOLUTELY FOR FREE by getting an account on Add Me Fast?